Have local geeky artists submit a button design to be made into buttons. After they submit the designs, contact me and we’ll work together so you can use these designs for more ideas below! If you need to raise funds for your event, what better way to raise the funds and provide advertisement at the same time! Buttons can be purchased individually or frame a bunch to be auctioned off as wall art! Use them as prizes for incentives to do things at your event. My local National Novel Writing Month (NaNoWriMo) region has new buttons to collect every year. You never want to miss out! Use the buttons as fliers to promote the event to share the hype. They also make a great souvenirs for the attendees to treasure! The International Geek Girl Pen Pal Club hosted an online camp. I partnered with the leader of my troop to provide my cabin-mates with troop themed buttons! 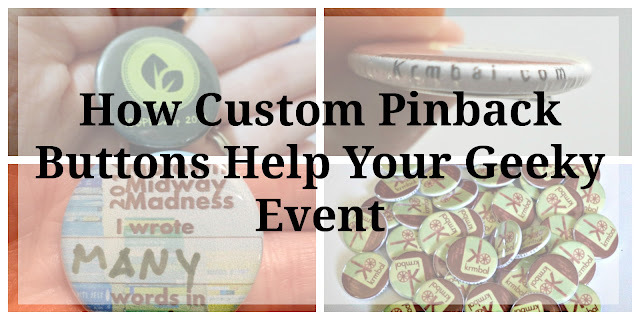 Use custom pinback buttons for your event attendees to get to know one another. Help them break the ice! Play a geeky version of "Guess Who" with a pinback button pinned to their back. Have the event URL or hashtag on the rim for advertisement and to make the pin a souvenir! Use pinback buttons to provide an extra surprise when customers purchase products from your booth at conventions or craft shows. Put your URL on the rim and you have a wearable business card! Krmbal Clothing did just that! Need custom pinback buttons for your geeky event? Click here!